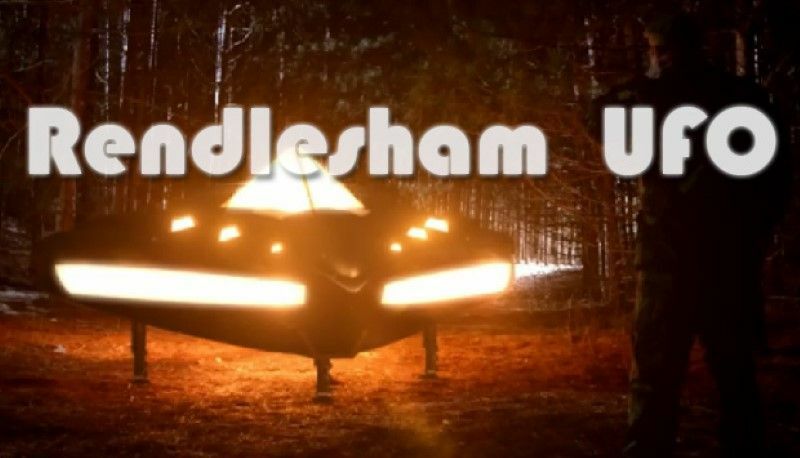 Over three decades ago from now, the most amazing UFO sighting claim in UK still belongs to the Rendlesham Forest incident in 1980 when encounters with aliens in Suffolk woodland were reported by US servicemen. The Rendlesham Forest incident not only involves one sighting, but a series or sightings of mysterious, unknown lights and the apparent landing of a spaceship or multiple craft in late December 1980 in Rendlesham Forest, Suffolk, England. US Air Force was stationed at RAF Woodbridge at the time, just outside the scene of the UFO sightings. USA personnel saw various UFO events in their own eyes for the span of two or three days. Now the Rendlesham Forest incident is still one of the best known UFO sightings in any parts of the world. It has been regarded as Britain’s version of the Roswell UFO incident in the US, the reason it is also referred to as Britain’s Roswell. In a statement released by the Ministry of Defence, the series of sightings did not bring a threat to national security and it was never been investigated as a security matter. However, evidence later surfaced indicating comprehensive investigation done by MoD as supported by substantial file on the subject. Claims of cover-up have risen tremendously after the public knew about the MoD file. Many interpreted the evidence as part of a larger conspiracy to hide the truth about the very true nature of UFOs by both British and United States governments. However, the MoD file that was released in 2001 consists mostly internal correspondence as well as responses to inquiries from the public. Believers believe that the file is not a whole truth and only released to continue deceiving the public. Meanwhile, sceptics said that the declassified documents only show that MoD were true to their earlier statement that the event posed no threat to national security. Sceptics note the lack of in-depth investigation done by the Ministry of Defence based on the content of the released documents. The sightings have been officially explained as a series of nocturnal lights, misinterpreted as extra-terrestrials in nature. Bentwaters and Woodbridge joint air bases, located near the Rendlesham Forest, have their share to this unforgettable case. On December 26, 1980, shortly after midnight, RAF Watton’s radar screens in Norfolk showed an unknown object suddenly disappeared in Rendlesham Forest in Suffolk. Located north of the forest, Bentwaters RAF also tracked the strange object on radar. Woodbridge, which was located south of the forest, and Bentwaters were reported to have housed nuclear weapons. The two bases were leased to the US Air Force. Radar operator on that night Mal Scurrah said that they were baffled with what was on the radar. They contacted air traffic agencies and they found out that there should have been no activity in the scene at the time. So, the only way to find out the mysterious object in the radar was to send a jet aircraft. When the jets reached approximately a quarter of a mile, one pilot reported that they could notice an unusual bright light in the sky, just in front of them. Reportedly stationary on the screen, the object then moved off at a tremendous rate of speed. In just approximately five minutes, the aerial thing suddenly reached 90,000 feet and higher until it disappeared on the radar scope. Even in today’s technology, nothing is known to perform such amazing manoeuvre. After such an unusual UFO event, sightings of a large glowing object started to take place. Three security guards, who were patrolling the twin bases, followed the lights into the forest upon receiving permission to check the scene. They went to the forest thinking that it could have been a commercial or military aircraft that crash landed. They were reportedly shocked to see a craft with a shape similar to a saucer. They further saw small beings with large heads, which appeared to be suspended by a beam from the bottom of the craft. These beings seemed to be very busy doing some kind of repair, the reason they did not notice immediately that they were being watched by the three men. Maintaining a safe distance from the landed object and strange beings, the guards immediately radioed the base headquarters to report what they had seen and requested emergency backup. The help arrived almost immediately consisted of the armed unit that included senior officers of the base. Reports later came out that witnesses who got closer to the craft experienced mysterious anomalies, such as reality-bending effects, surreal atmospheric conditions, and time displacement. Allegations of communication between the alien beings and senior officers also came out off the record. On the second night of the sighting, Colonel Halt was one of the group of senior officers called out to chase the glowing object into the forest. He later became a key figure of the Rendlesham Forest UFO sightings investigation. He made a detailed documentation of his journey in the inquiry. He also sent a memorandum to the British MoD. Stories have surfaced that men who witnessed strange events on the Rendlesham were gathered in an underground theatre, interrogated, sworn to secrecy, debrief, and threatened.